The year is coming to a close, and the world approaches the ever futuristic sounding year 2010. 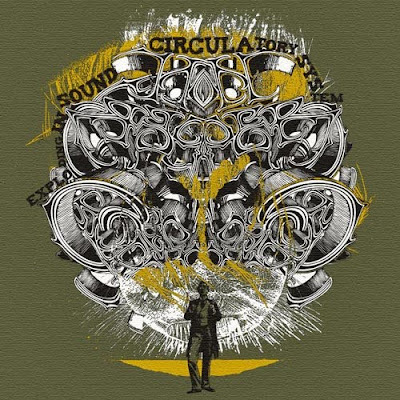 With the decade in its closing stages, a strange and disjointed musical era comes to an end, but not before Exploding In Sound returns with the biggest and most triumphant compilation yet… CIRCULATORY SYSTEM. Like the organ system that spreads nutrients our bodies can’t live without, helping fight disease, Exploding In Sound aims to do similar for your musical distribution network with the fourth installment of its acclaimed series. Through the nineteen track Circulatory System compilation, I aim to spread great new music to everyone interested in helping fight the disease that is tired old generic rock. It’s with the spreading of the compilation that we can combat the toxins being force fed to us with truly incredible new music that will prove beneficial for the mind, body, and soul. Featuring new music from some of the greatest independent bands in the world including The Willowz, Rishloo, Constants, Radio Moscow, Irepress, Stomacher, The Boxing Lesson, and many more, Circulatory System is a 100% FREE digital download, containing artwork, band descriptions, links for further enjoyment, and more. With a release date strategically following in the wake of Thanksgiving weekend, I am enormously thankful and humbly gracious for everyone who has helped put this record together, especially the bands, their labels, and management. Without the willingness and cooperation of these incredible artists none of this would be possible, and your cooperation is appreciated and never forgotten. To the fans of the site, thanks for your continued support and I know you'll enjoy what I truly believe to be the most spectacular compilation yet! As always, support the artists and great music will continue to be made. Thanks. Sharing of the download link is HIGHLY recommended and encouraged to anyone and everyone you think might be interested. As this is a FREE compilation, the goal is to gain the maximum audience achievable, and the power of word of mouth is never underestimated. THE TIME TO LET THE ‘CIRCULATORY SYSTEM’ FLOW HAS ARRIVED… GET OUT THERE AND DOWNLOAD, SHARE, POST, and SPREAD the word to everyone you know. Great music is being made, and it’s up to us, the fans, to deliver it to as many willing listeners as possible. ENJOY! Special thanks go out to all of the bands, Zachary Howard for his incredible artwork, Ty Griffin (www.tygriffin.net), Lindsay and Joel at The Mylene Sheath, Ben Gram, Craig Cirinelli, Mary Ghaffari, Larry Suglio, Ryan Cano (The Loyalty Firm), Casey Tipton, Alex Mohler, Tony Pennington, Jenny Tuite, Ridd Sorenson, Pete at Ernest Jenning Record Co, my family, friends, and everyone who is supporting the cause. We're only getting started. So, like before, the price is right and Mr. Goldin continues his quest to promote and build up some deserving bands. Download the album, check it out and offer up some support. I’d like to highlight Radio Moscow, Ultra Violent Lights, Bloody Knives and Irepress.